ePNCart offers online internet merchants an easy to implement integration, customizable secure shopping cart payment gateway software for website storefronts. It is an easy to setup, yet powerful, integrated shopping cart designed to automate online website credit card processing transactions at your business. This will help merchants increase sales by giving them the ability to accept all major credit card payments online through the website with EPN Shopping Cart Software. The Product Page Generator creates HTML code pages for a merchant's Web site using easy to follow, step by step instructions for quick set up, conveniently generating a Web page with full eCommerce capabilities. If you already have a website, The Button Generator will create the shopping cart HTML code for the "Add to Cart", "View Cart" and "Checkout" buttons, no need to disrupt the flow of your existing website. Easy Cut & Paste HTML Code Shopping Cart Payment Gateway Software. A shopping cart takes your online website business to the next level, allowing for full eCommerce credit card processing capabilities. 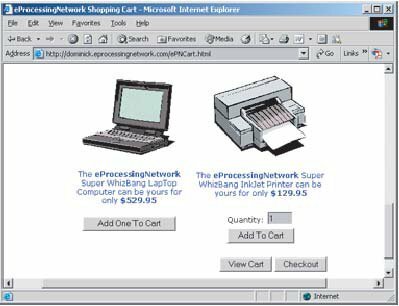 eProcessing Network has an integrated shopping cart option or you can use our secure payment gateway to integrate with hundreds of other shopping cart software providers. The ePNCart integrated shopping cart will provide you with easy cut and paste HTML of your products or services. The shopping cart HTML will already be integrated with your secure payment gateway. You will receive an email receipt when a credit card transaction is done on your website to fill the order.Add ePNRecur to setup Automatic Recurring Billing Payments for your customers on your website. Accept Credit Cards on your Website !